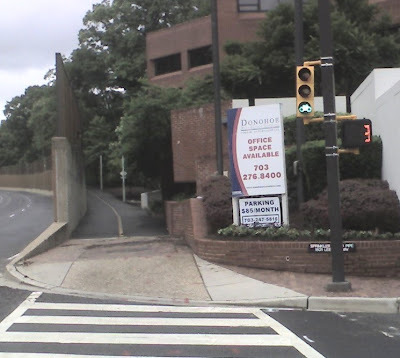 Arlington County has installed a bike-only signal in the Rosslyn area of the Custis Trail at the corner of N. Oak Street and Lee Highway, which went into service on Tuesday, May 17. This is one of the intersections on the "Rosslyn Hill" section of the Custis that includes several crossings. There have been collisions at some of these crossings in the past. 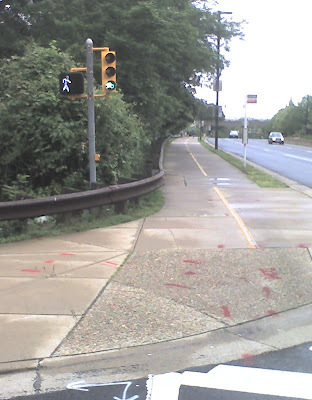 This area is definitely the most dangerous section of the Custis Trail. This crossing already had a walk/don't-walk pedestrian signal, which would inform cyclists about the status of the cross traffic. There is no right-turn-on-red at this intersection, so cars waiting on Oak Street should (theoretically) not create a conflict when the bike signal is green and the pedestrian signal is in the walk mode. Cyclists need to take care about right-turning traffic from Lee Highway onto Oak. Although these cars are supposed to yield to bikes and peds in the crosswalk, one should always take care that they actually do. The bike signal remains green after the pedestrian signal starts flashing. Since bikes can cross much faster than pedestrians, this makes good sense. The photo below shows the bike signal still green while the ped signal is flashing "don't walk" with 3 seconds left. There is a yellow bike signal that illuminates for a 2-3 seconds before changing to red. Bike signal at N. Oak street looking west along Lee Highway. Custis Trail is visible behind sound wall. 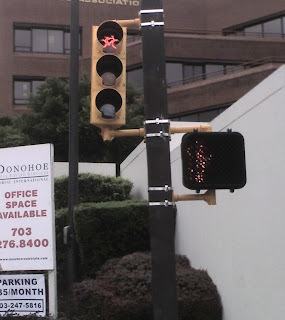 Signal is green while "don't walk" signal is flashing. Here's a close-up of the red "stop" bike signal. I did not observe bicycle behavior at this intersection with the new signal. The signal is green for much more of the time than it is red, probably 75% of the time. So most of the time cyclists will be able to proceed through this intersection without pause. It will be interesting to see how cyclists behave with this new signal: if they will treat it like a car would treat a traffic signal or more like an "Idaho stop."